Only a few parts of wreckage have been found, such as this piece of a wing flap that washed up in the Indian Ocean. FIVE witnesses could hold the key to finding the exact spot where missing flight MH370 crashed, an investigator claims. Noel O'Gara, who has spent four years probing the world's greatest aviation mystery, believes the jet was shot down by mistake by the Malaysian military. The Irish private sleuth has identified crucial accounts from people who say the saw the doomed plane's final moments, according to the The Daily Star Online. He says this information can be used to locate the missing Boeing 777 - unless the Malaysian Government has already removed every trace to cover up their blunder. 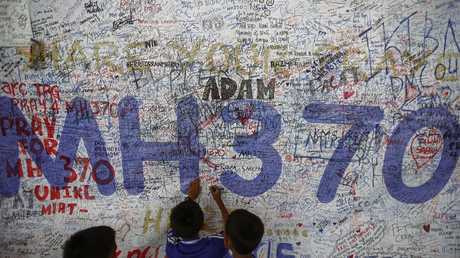 "Most likely, MH370 is still lying on the sea bed in that area," Mr O'Gara said. "Unless the Malaysian Government recovered it later. "They would know exactly or within a few miles of where it had come down." One of the witness accounts is said to come from New Zealand oil worker Mike McKay, who says he saw a plane on fire over his rig near Vietnam. The aircraft was "ascending rapidly in the struggle for control of the plane" and appeared to fall again, Mr McKay claimed. Malaysia Airlines flight MH370 took a mystery left turn an hour after takeoff, radar data showed. Marked here is the spot where a fisherman claims he saw it crash in the Malacca Strait. Latife Dalelah was a passenger on another flight when she saw what she believed was a plane on the surface of the water "in the crucial place and at the crucial time". The third witness is Katherine Tee, an English sailor who told the official Australian search organisation she saw a burning plane on her way to Phuket in Thailand. "Tee saw a plane go down and two smaller planes high overhead heading off in that area and at that time," Mr O'Gara said. 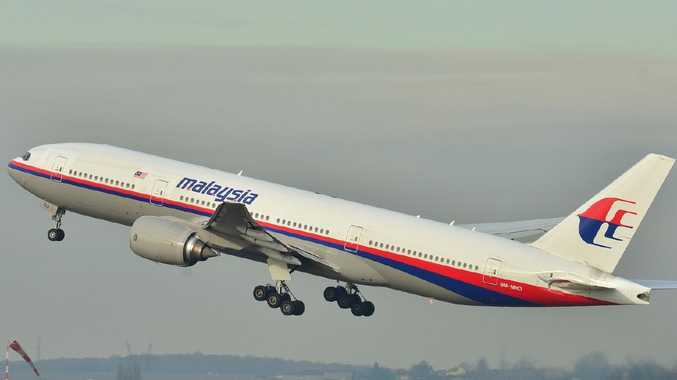 It's claimed this could be evidence fighter jets downed the Boeing 777 - perhaps because of fears it had been hijacked. 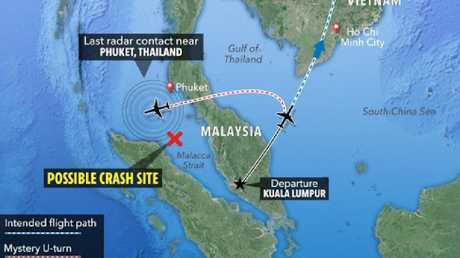 Mr O'Gara's fourth and fifth witnesses are two Malaysian fishermen who say they saw the plane come down off Kota Bharu. The Malaysia Airlines Boeing 777 vanished nearly five years ago with 239 on board. Mr O'Gara claims the Malaysian Government may have covered up what happened and secretly removed the evidence from the sea bed. Only small pieces of wreckage have been found since the Malaysia Airlines jet vanished over the Malacca Strait with 239 on board in March 2014. It was heading from Kuala Lumpur to Beijing when radar showed it took an unexplained left turn back across the Malay Peninsula. Satellite pings suggested it kept flying for another seven hours, leading official search teams to concentrate their efforts 1600 kilometres west of Australia. A detailed sonar scan of the ocean floor found no trace it was ever there, giving rise to a raft of rival theories. One aviation expert said it could have been brought down by a stowaway who stormed the cockpit in a 9/11-style hijacking. Last week an amateur sleuth claimed he had evidence it landed in the jungle in Cambodia. Fisherman Rusli Khusmin said he saw the crash and recorded the spot on a GPS device.